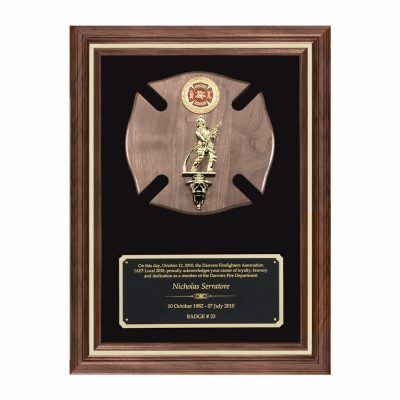 This larger maltese cross fireman figure plaque is an award to cherish. Ideal for a fire service award, top responder or to give respect and honor to anyone in a fire department who has reached achievement. This is a 17” wide x 24” tall walnut plaque featuring gold trim. A walnut Maltese cross is mounted on a velour background in the center of the award. Mounted on the cross within, is a fire medallion as well as a figurine of a firefighter. The matching nameplate can contain your basic artwork and text imprinted in gold to match this award, for a truly classy look. Price includes item, nameplate and basic artwork and text on plaque.